Surrey residents will soon have a brand new kind of grocery shopping. 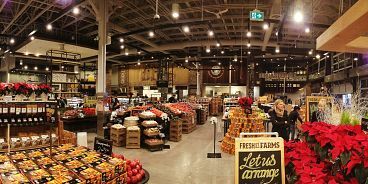 Fresh St. Farms, at 15930 Fraser Highway in Surrey’s Fleetwood Village, aims to capture the feel of a buzzing farmers’ market with its distinctive variety of locally sourced foods. The store is made even more unique by its dedicated food destinations that include a curry bar, sandwich bar, and fresh grill. Fresh St. will carry an incredible variety of local and rare finds such as Canada AAA ANGUS Beef (rated among the top 4 per cent of all beef), hormone-free and BC-raised organic chicken, Ocean Wise seafood and unique cheeses ranging from local artisans to international discoveries. Customers can expect to see local vendors sampling foods, and sharing the stories of what they grow, produce and create in our province. A good example would be the Fresh St. Farms in-store location of Victoria’s cutting-edge Fresh Cup Roastery Café. The café takes fresh coffee to a new level with daily on-site roasting of organic coffee done with zero emissions. “We are excited for Fresh St. Farms to open. We can’t wait for people to experience grocery shopping as an opportunity to connect with their food and where it comes from.” adds McCurdy. For more information, please visit www.freshstfarms.com.